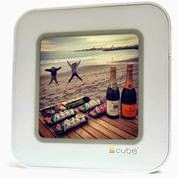 Frugal & Fabulous: Review: Enjoy your Pictures Anytime with #Cube! Review: Enjoy your Pictures Anytime with #Cube! I love taking pictures with my phone and posting them on Instagram. It's my favorite social network because it's visual and a great way to see what my friends are up to. But I'm busy and I have a hard time keeping up with my friends and social networks. So I love my #Cube! It's basically a small tv that plays your Instagram feed, cycling through photo posts and videos. It has an 8 inch touch screen display so it's easy to use and very functional. You can plug it in or let it run on battery power (it's rechargeable) so you can view your favorite posts anywhere you have WiFi! Want to mix it up? You can scroll through your favorite hash tags or view photos/videos by your favorite user. Want to view your own photos? Just type in your Instagram username and the #Cube will scroll through all of your images and videos! You can even like/favorite photos and videos via the #Cube! Just hit the heart button on the top of the screen and it's done. #Cube requires zero attention. It automatically & continuously delivers a real-time stream of photos & video clips for you to enjoy- so it's something you can leave on all day. I love streaming mine in my office or my living room so I can catch up on outfits of the day (#ootd) by fashion bloggers or see hauls by my favorite couponers while I'm working or doing chores around the house! Want a #Cube of your own? Click here to learn more!